AKTAU – After two decades of diplomatic efforts, the five Caspian Sea nations signed the convention on the water reservoir legal status that had been in the works since 1996. In addition, six more documents were signed on various aspects of cooperation. 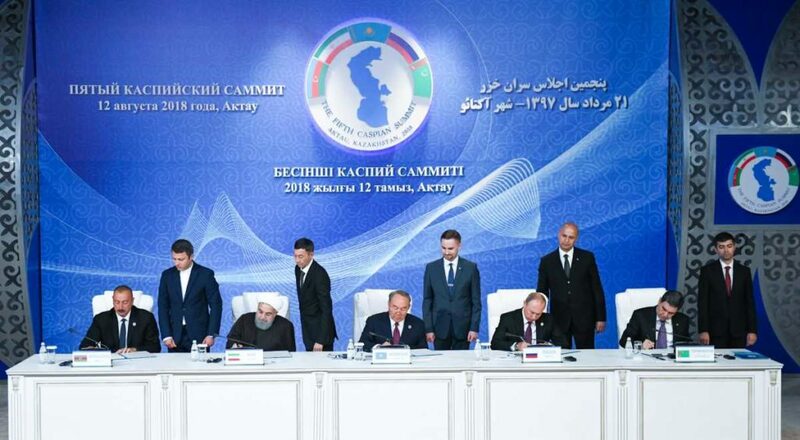 The convention and the agreements were signed on the International Day of the Caspian Sea during a summit in Aktau by Kazakhstan, Turkmenistan, Russia, Iran and Azerbaijan. The convention establishes the rights and obligations of the parties with respect to the sea, including its waters, the bottom, subsoil, natural resources and airspace. The convention also settles a long dispute over whether to consider the water body a sea, which would make it subject to international maritime law and accessible by outside countries, or to consider it a lake, which would require dividing it equally among its five coastal nations. The status establishes territorial waters within fifteen maritime miles, external borders become state borders where each country exercises subsurface rights; ten-mile fishing zones adjoin the territorial waters and are under the exclusive fishing rights of each state. Outside the fishing zones, the common water area remains unchanged; beyond the state lines, the freedom of maritime navigation applies to ships of coastal countries. The countries agreed on freedom of transit to other seas and oceans and foresee the possibility for laying pipelines under the waters if environmental requirements are observed. 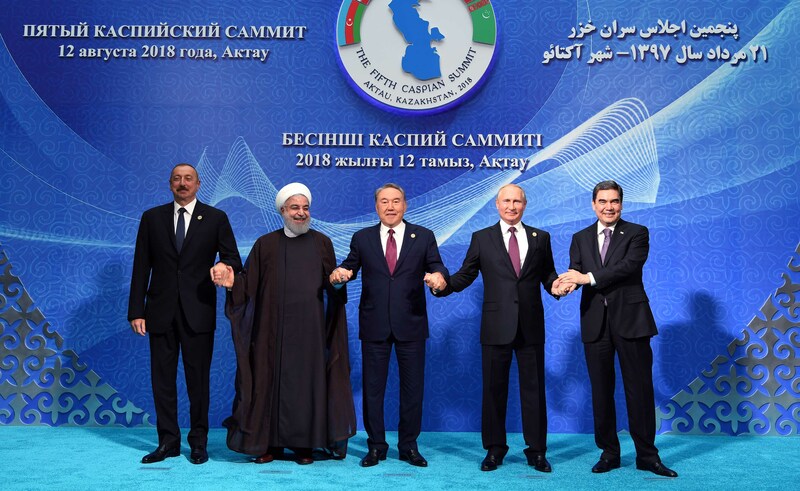 Previous Caspian summits took place in Ashgabat (2002), Tehran (2007), Baku (2010) and Astrakhan (2014), giving the political impetus to the negotiation process and stimulating the achievement of consensus. The Aktau summit was preceded by the final 52nd meeting of Ad Hoc Working Group and a Ministerial of the Caspian States where foreign ministers signed a protocol on actions to be taken upon the signing of the convention. “The region has a unique culture, significant human resources [of 240 million people] and is rich in natural resources; due to its location, the sea also has geopolitical importance,” said Kazakh President Nursultan Nazarbayev at the summit. The summit participants covered issues of ensuring security, preventing emergencies and regulating military activities of the Caspian states. Some of the fundamental principles agreed upon include transforming the region into a peaceful zone of good-neighbourliness and friendship; using the waters for peaceful purposes; respecting sovereignty and territorial integrity of each other; not allowing the military presence of third parties. Among challenges addressed was the sea’s proximity to the areas of political instability. In this regard, Nazarbayev proposed a multilateral agreement on confidence-building measures in the field of military activities. The Kazakh President invited the leaders of littoral states to explore the potential of the convention regarding energy, transport and transit sectors, as well as proposed to optimise the tariff policies between members of the convention. “We have discussed measures for multilateral cooperation and signed trade, economic, transport and security agreements,” Nazarbayev said at a press briefing after the summit. He noted that all parties considered the deal – already dubbed the “Constitution of the Caspian Sea” – from the point of ensuring political stability, developing the region while preserving and enhancing its natural and bio resources. “The Aktau summit demonstrated once again the ability of Caspian Five to jointly solve large-scale tasks,” he said. Heads of state of Azerbaijan, the Islamic Republic of Iran, Turkmenistan and Russia have also made statements on the convention. Nazarbayev later held bilateral meetings with each leader of the Caspian countries. President of Azerbaijan Ilham Aliyev noted that the Alyak Port his country launched in May will ensure full integration of traffic flows in connection to the newly opened Kuryk multimodal hub. “Trade (between our countries) is growing and the cargo transportation is increasing, agricultural products supply is especially active,” President Hassan Rouhani of Iran said during the meeting on the sidelines of the summit. He underlined that Kazakhstan has always been supportive of Iran on international stage while complying with international agreements on nuclear issues. “Although actively growing, our trade relations have large potential to be explored,” said President of Turkmenistan Gurbanguly Berdymukhamedov. 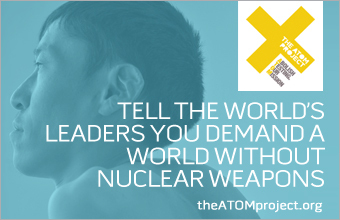 The two leaders are to meet later this month in Turkmenistan to discuss the Aral Sea.